Video of Martin’s appearance on The Joe Rogan Experience—where she recounted her eyewitness account of human rights violations—went viral on social media. The interview garnered over 1.5 Million views on Facebook alone. While the UK-based Israel Advocacy Movement has a meager viewer base of only 3,500 subscribers, the video was then promoted on social media by the well-known organization “StandWithUs,” which exists to cultivate pro-Israel propaganda on social media. 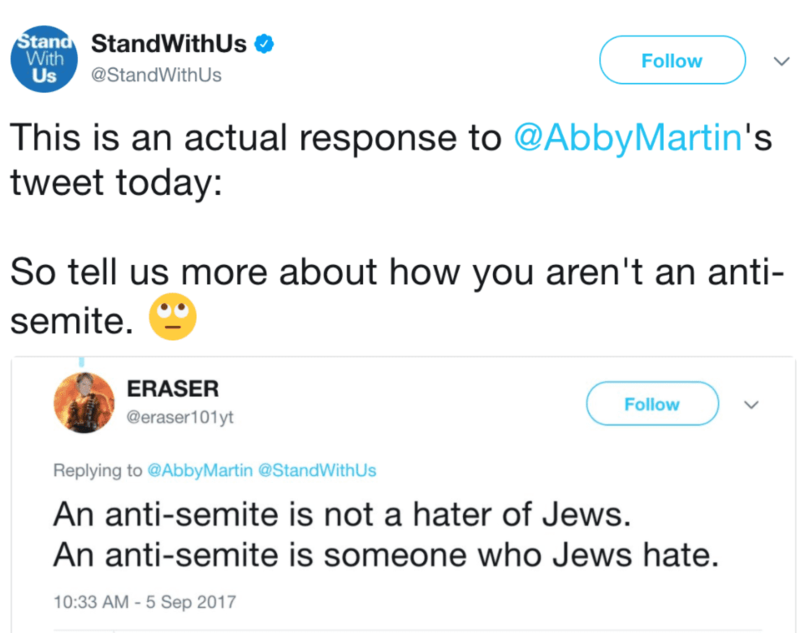 Posting the video, StandWithUs called Martin a “notorious anti-semite” and that “she spewed ridiculous lie after lie in her attempt to smear Israel … Enough is enough.” They engaged Martin in other online attacks. StandWithUs, which operates on a $9 million annual budget, receives a large amount of funding and direct instructions from the Israeli government itself. In their official funding contract with the Israeli Prime Minister’s Office, StandWithUs is employed to manage “interactive media war rooms” to run government messaging. In response to these “war rooms” now targeting Martin, she released a special episode of The Empire Files on Oct. 1. This shocking episode features a range of people in Jerusalem’s so-called “Tolerance Square.” Each interview shows with striking clarity how much racist, supremacist and even genocidal views are prevalent in Israeli society. A young woman declares plainly “we need to kill Arabs” while she and her friend giggle uncontrollably. Today, most of the remaining Palestinian territory remains under brutal military occupation, and is shrinking from rapidly-expanding illegal settlements. While the Netanyahu government plans big moves with greater freedom from the Trump Administration, this colonial project survives on lavish US funding, a carefully-crafted public image campaign, and threats against public figures who question Israel’s moral supremacy. While the Israeli state and it’s propaganda arms like StandWithUs wield a massive apparatus to depict itself as a peace-seeking victim, Martin’s new Empire Files offers an irrefutable look behind that curtain.